Published: Aug. 3, 2012 at 05:29 p.m. 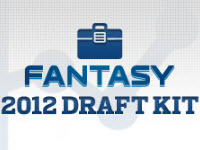 If you're like me, you're really starting to prepare and ramp up for the start of your fantasy football draft season. The calendar has rolled over into August, and there's just a few weeks before we start the 2012 NFL campaign. That means you're likely shuffling through your player rankings, cheat sheets, depth chart, sleepers, busts and whatever other information you hold dear to your heart in an effort to dominate your competition. (Remember, you can get everything you need to have a successful draft in our in-depth and up-to-date fantasy draft kit right here on NFL.com). But before you get ready to draft your brand-new fantasy football squad, take a few moments to look at these 32 helpful and interesting little nuggets per team that could give you the edge when it comes to making those tough decisions. Should you draft Matthew Stafford or Cam Newton? How big of a risk is Maurice Jones-Drew? Will Calvin Johnson repeat his amazing 2011 numbers in back-to-back years? Read along and you be the judge. Larry Fitzgerald played in 16 games last season. In the eight contests where Kevin Kolb led the team in pass attempts, he averaged 4.7 receptions, 82.2 yards and scored two touchdowns. In the other eight games, where John Skelton led the team in pass attempts, Fitzgerald averaged 5.2 receptions, 94.1 yards and scored six touchdowns. Kolb is the current favorite to start heading into 2012. In the final eight games of the 2011 fantasy football season, Matt Ryan averaged 298.5 passing yards and threw for a combined 18 touchdowns. He failed to throw for at least 250 yards just once and tossed multiple touchdown passes five times in those contents. Project those totals over a full year, and Ryan would be at 4,776 yards and 36 touchdowns. His average draft position is Round 9. Torrey Smith was targeted 96 times in 2012, which ranked second behind Anquan Boldin (106) among wide receivers on the team. A total of 20 of those targets came at least 30 yards downfield, with Smith catching just one quarter of those passes. Joe Flacco overthrew his receiver 18 times on passes in the vertical game, however. Smith averaged a solid 16.8 yards on his 50 rookie receptions. In the first 10 games of last season where Fred Jackson and C.J. Spiller were both active, Jackson averaged 20.9 touches per game and was on pace for over 2,000 yards from scrimmage. Spiller averaged fewer than four touches in those same contests. If you project Jackson's 2011 fantasy points over 16 games, he would have finished with 271.36. That would have been third-best among backs. Before last season, six quarterbacks had rushed for double-digit touchdowns in a single campaign. Their rushing touchdown totals the following year were one, two, one, seven, four and five. In a more recent example, Michael Vick rushed for a solid nine touchdowns in 2010 but scored just once on the ground in 2011. Cam Newton set an NFL record with 14 rushing scores as a quarterback last year. In 2007-2008 as a member of the Denver Broncos, Brandon Marshall was targeted a combined 351 times and recorded 206 receptions with 2,590 yards. He posted those numbers with Jay Cutler as his quarterback and Jeremy Bates as the quarterbacks and wide receivers coach. Marshall was traded to the Bears this offseason, where Cutler is the quarterback and Bates is the quarterbacks coach. In his final three years in the Queen City, Cedric Benson averaged 298 carries, 1,143 rushing yards and scored a combined 19 rushing touchdowns. BenJarvus Green-Ellis, the expected starter in 2012, has never rushed the football more than 229 times in a single season. He has also rushed for 1,000-plus yards just once in his NFL career. The Law Firm's current ADP is Round 8 (76.94) on NFL.com. Greg Little had 121 targets in his rookie season. That was more than A.J. Green (115), Vincent Jackson (115), Mike Wallace (113), Marques Colston (107), DeSean Jackson (104) and Dez Bryant (103). Little also dropped 14 passes. His main competition for targets in the 2012 pass attack is Mohamed Massaquoi and rookie wide receivers Josh Gordon and Travis Benjamin. In the five games where he saw 20 or more carries as a rookie, DeMarco Murray rushed for a combined 687 yards (137.4 per game) and averaged a ridiculous 6.0 yards per carry. Overall, he averaged 5.5 yards per attempt. Murray received 20-plus rushing attempts five times in his final eight games before suffering an injured ankle in Week 14. Murray's current ADP on NFL.com is Round 3 (27.67). Jacob Tamme hauled in 67 passes for 631 yards and scored four touchdowns in the last 10 games he played for the Indianapolis Colts while Peyton Manning was still the team's quarterback. Based on those numbers, Tamme would be projected to finish a full season with 107 catches with 1,019 yards and six touchdowns. The Broncos added both Manning and Tamme as free agents during the offseason. Calvin Johnson was the top wide receiver in fantasy football last season, catching 96 passes for 1,681 yards and 16 touchdowns. No wideout in NFL history has ever recorded back-to-back seasons with 1,600-plus yards and 16 touchdown catches, not even the great Jerry Rice. Of the 11 wideouts to hit the 1,600-yard mark before Johnson, none of them even reached 1,400 yards the following season. Last season, Aaron Rodgers led all quarterbacks in fantasy football points (397.42) and passer rating (122.5), was fifth in passing yards (4,643), second in touchdown passes (45), and was tied for second in terms of the fewest interceptions (6) thrown. He accomplished all of these things despite finishing just 16th (behind Josh Freeman, Matt Hasselbeck and Andy Dalton) in total pass attempts. In the four games Matt Schaub played with Andre Johnson in 2011, the quarterback averaged 240.2 passing yards and threw seven touchdown passes. In the six games without Johnson, he averaged 253.1 yards and threw for eight scores. If you project the fantasy points he scored in his 10 starts over a full year, Schaub would have finished ninth at his position and two points behind Philip Rivers. Donald Brown rushed for a combined 492 rushing yards in the final eight weeks of last season, averaging 4.8 yards per carry in those contests. If you remove the 80-yard touchdown run he put up against the Tennessee Titans, however, Brown's totals drop to 412 rushing yards and an average of just 4.0 yards per carry. He is the current favorite to start for the Colts once the regular season opens. The three most recent big-name running backs to hold out of training camp over contractual squabbles are Chris Johnson (2011), Steven Jackson (2008) and Larry Johnson (2007). Johnson posted some of the worst numbers of his career upon his return, while Jackson and Johnson missed a combined 12 games due to injuries. Maurice Jones-Drew is in the middle of a contract holdout with the Jaguars. In the nine games that Dwayne Bowe played with Matt Cassel at quarterback last season, he averaged 4.5 receptions and 73.6 yards. In the seven games where Bowe was catching passes from Kyle Orton or Tyler Palko, he averaged 5.7 receptions and 70.8 yards. The big difference here is in the touchdown department. Bowe scored four times with Cassel under center and just once without him. Reggie Bush averaged 38.6 rushing yards and didn't rush for a touchdown in the first six games of 2011. Over his final nine contests, he rushed for an average of 94.8 yards and found the end zone a combined six times. During that time, Bush rushed for 100-plus yards five times. That's five more such performances than coach Joe Philbin's offense produced in Green Bay during the entire year. Adrian Peterson carried the football 15 or more times seven times last season. In those games, Percy Harvin averaged 36.5 receiving yards and scored a total of one touchdown. In nine games where Peterson was out or received 14 or fewer carries, Harvin averaged 79 receiving yards and scored a combined seven touchdowns. Peterson could be limited to start this season after major knee surgery. Over the past two seasons with Josh McDaniels serving as either his coach or offensive coordinator, Brandon Lloyd saw more targets of 20 or more yards than any other wide receiver in the league. In 2010 with McDaniels calling the shots, he was the No. 1 wide receiver based on fantasy points. Kyle Orton and Tim Tebow were his primary quarterbacks that season. He now has Tom Brady at the helm. Mark Ingram missed a total of six games last season due to injuries, finishing with 474 rushing yards (3.9 YPC) and five rushing touchdowns. Before he went down, the Alabama product was on pace for 195 carries and 213 touches. Ingram finished with 122 rushing attempts and still led the Saints in carries and was third in rushing yards despite not being on the field in 37.5 percent of games. Ahmad Bradshaw missed four games last season due to injuries and still scored 11 touchdowns. Brandon Jacobs scored seven touchdowns, all of which came from 10 yards or closer. What's more, four of those scores came from 1-yard out. Jacobs is now a member of the San Francisco 49ers, leaving Bradshaw to see more work inside the red zone. His current ADP on NFL.com is Round 5. Mark Sanchez finished a surprising 10th in fantasy points among quarterbacks in 2011, scoring 237.26 points on NFL.com. That was more than both Michael Vick and Ben Roethlisberger. His six rushing touchdowns were tied for second-most at his position behind Cam Newton and tied with Tim Tebow. The Jets traded for Tebow during the offseason and plan to utilize him often in the red zone. Darren McFadden averaged 16.9 fantasy points per game in 2010 and 14.9 fantasy points per game in 2011. If you project the totals he scored in each of those years over a full season, McFadden would have finished second and fifth respectively in fantasy points at his position. The veteran has missed a total of 12 games over the last two years due to injuries. He has a current ADP of Round 2. DeSean Jackson has caught a combined 105 passes and scored 10 touchdowns over the last two years. Wes Welker caught 104 passes and found the end zone nine times in the first 14 weeks of last season alone. Jackson has also posted 100-plus receiving yards just twice in his last 16 games and none since Oct. 2, 2011. In his final nine contests, Jackson averaged 61.2 yards and scored just twice. Antonio Brown broke out in Week 7 of last season, catching seven passes for 102 yards against the Arizona Cardinals. Starting that week and throughout the rest of the season, Brown was tied for 17th in receptions while finishing eighth in receiving yards and 12th in targets. Over that same time period, Mike Wallace was 44th in catches, 32nd in receiving yards and tied for 40th in targets. Over the final 10 games of 2011, Philip Rivers threw for 240 or more yards nine different times and hit the 300-yard mark on three separate occasions (he also hit 270 yards five other times). He also threw for multiple touchdowns in six of those 10 contests. While Rivers did throw for a career-worst 20 interceptions, he threw a mere three picks over his final six starts (199 pass attempts). The last time Randy Moss posted a 100-yard game was in November 2009 as a member of the New England Patriots. Tom Brady was his quarterback. In his next 23 games, Moss averaged 33.3 receiving yards. He has also scored just one touchdown in his last 11 games. That was back in 2010 (Moss didn't play a game in 2011). He signed with the 49ers this offseason. Alex Smith is now his quarterback. Sidney Rice was a fantasy star in 2009, catching 83 passes for 1,312 yards and eight touchdowns as a member of the Minnesota Vikings. Brett Favre was his quarterback that year. In the 18 career games that he played where Favre was the team's leader in pass attempts, Rice averaged 77.1 receiving yards per game. In his other 39 career games without Favre, Rice has averaged 31.4 yards. Over the past three years, Steven Jackson has missed just two games while averaging 304 rushing attempts and 1,267 rushing yards. The veteran has also rushed for just 15 touchdowns, or 0.32 scores per game, in that time. In his previous three seasons, Jackson missed a total of eight games due to injuries. He rushed for 25 touchdowns, or 0.83 scores per game, and rushed the ball an average of 278 times. Kellen Winslow finished second in targets for the Buccaneers in each of the last two seasons, including 121 in 2011. That was second to Mike Williams (124). Vincent Jackson led all San Diego Chargers wideouts in targets last season with 115. Winslow was traded to the Seattle Seahawks this offseason for a conditional 2013 draft pick. The Bucs signed Jackson to a five-year, $55 million contract in March. Chris Johnson was considered the biggest bust in fantasy football last season. In his first eight games, he rushed for 366 yards (45.7 YPG). CJ2K went on to rush for 681 yards (85.1 YPG) in his final eight contests with three 100-yard performances. If you project his rushing yards in that time over a full year, Johnson would have rushed for 1,362 yards. That two yards less than he rushed for in 2010. During their 16 games last season, the Redskins had four different running backs (Tim Hightower, Roy Helu, Ryan Torain, Evan Royster) lead the team in carries. Only Torain (11.7) didn't average 19 carries in the games he received the most work. Helu (6) led the Skins in most rushing attempts in the games he was the leader. He is currently running with the second-team offense behind Royster in camp.